Crabtree Falls – Let's Go RVing! Started the day off slowly enjoying a cup of good coffee and then got a text from Helen Jo a little after 7:00 asking if I was up. Fixed a second cup of coffee and called her and we talked for over an hour. In fact we talked so long Jerry went back to the bedroom to read and went back to sleep. I figured he needed the rest so I didn’t wake him after I finished talking with Helen Jo. We finally got it altogther though and left about 10:30 for Crabtree Falls in Montebello. 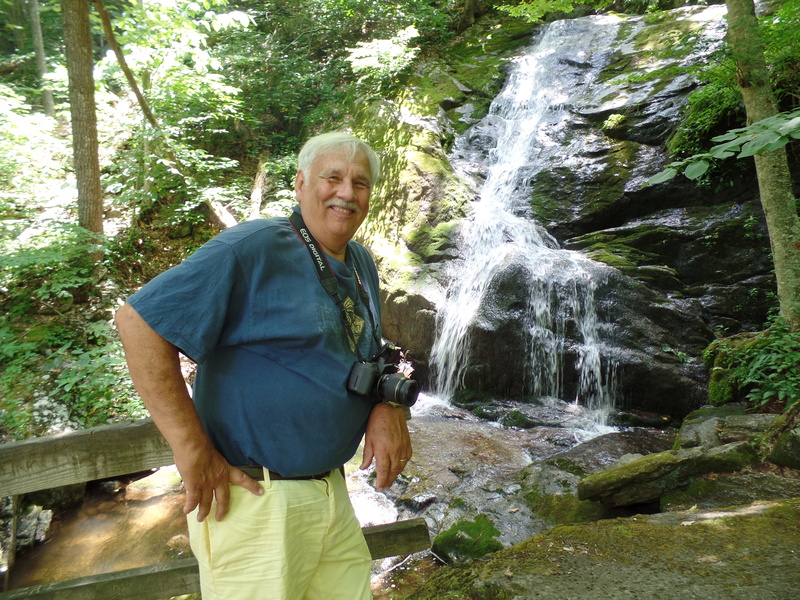 We had talked about hiking at Humpback Rock which was about 1/2 the distance to Crabtree Falls but when Jerry looked at the trail distance we decided that we were not quite seasoned enough for such an endeavor so we decided on Crabtree Falls instead. 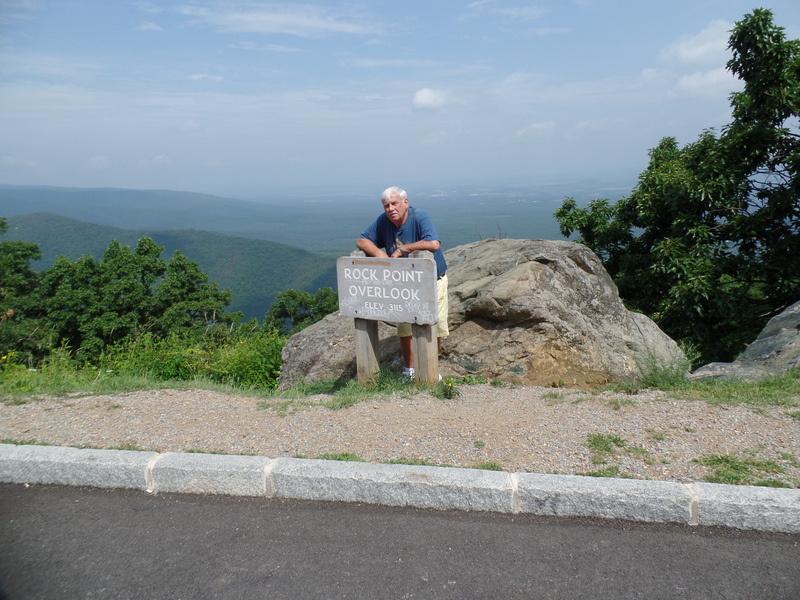 We took the Blue Ridge Parkway part of the way and it was a winding road. For a while we followed a motor home towing four down and I was hopeful that they would stop so we could chat but they never did. Interestingly enough we saw a number of bikers and even more interesting they were all going up hill abeit with a struggle. Some of them teetered so much I was afraid they’d fall in our path. We stopped at several lookouts and took lots of pictures. I tried to get a picture of the name of the lookout so we could know exactly where everything was taken. We’ll see how that works out. Jerry took his camera and I had my new one so I imagine we have a lot of mixed up pictures. We got to the falls and immediately checked out the bathroom facilities. They were gross to say the least. A portapotty in a little room – enough said. I washed my hands with the water I had left in my water bottle! Before we started our hike we decided to eat our sandwiches that we had prepared earlier. As we were eating we were chatting with another couple and I asked where they were from and he said everywhere. They both teach English and have just left Korea and are going to China after visiting his father in Staunton. He suggested that we might be interested in teaching abroad if we were interested in traveling but Jerry told him that first we wanted to see the USA. We started the trek up to the water falls. The first one was easily accessible and very pretty. The weather was nice and we had a nice breeze and then … we started up toward the next one which was two miles further. I didn’t know that .3 of a mile was so far. The breeze disappeared and it got really hot. We stopped and chatted with some people and decided that we really didn’t need to see the top of the falls. When I saw people in hiking boots with backpacks and pith helmets I knew we were out of our league. We hiked back down to the car and Jerry was wet as water. Came on back to the motor home and Jerry decided to take a nap. About 3:45 I decided to join him however I don’t think I ever went to sleep. Just as I drifted off a big rig, an Allegra came in and for some reason decided he had to back his rig in his pull through. The thing beeped for about 10 minutes, enough to wake the dead. We got up and decided we’d get groceries and ride through the University of Virginia. We really wanted to see the rotunda which I learned was closed for construction plus I wanted to see the chapel. After a stop at the Hess station where gas was $3.23 we went to Harris Teeter Then we rode through the campus but never found either building. The sky was looking bad and there was a forecast of heavy rain and thunderstorms so we headed on back to the RV. We ran into some heavy rain but fortunately when we got back to the campground it hadn’t rained at all. Jerry grilled hot dogs and I fried some french fries in the fry daddy We had homemade chilli, relish and onions and it was all good. Since we drank the last of the tea tonight I fixed another pitcher. I used the water we had brought but had to add a little of the campground well water. After dinner I went outside and read a bit and Jerry joined me after talkng to Julie on the phone. After reading for a while we went for a walk around the campground. It really is a nice place and it’s quiet and peaceful now that all of the week-enders are gone Shame on me for saying that. There are several big rigs parked around us but everyone seems to be staying inside. I have only seen one couple walking their dogs but they didn’t pass our way so we didn’t get to speak. A night for reading and then early bed.